The NOC/Brega Fuel Crisis Committee has reported that due to its anti smuggling efforts fish prices are now down in Tripoli (Photo: Fuel Crisis Committee). The National Oil Corporation’s (NOC) Brega Fuel and Gas Crisis Committee reports that it has had continued success in its anti-smuggling and profiteering activities across the country in a variety of sectors. 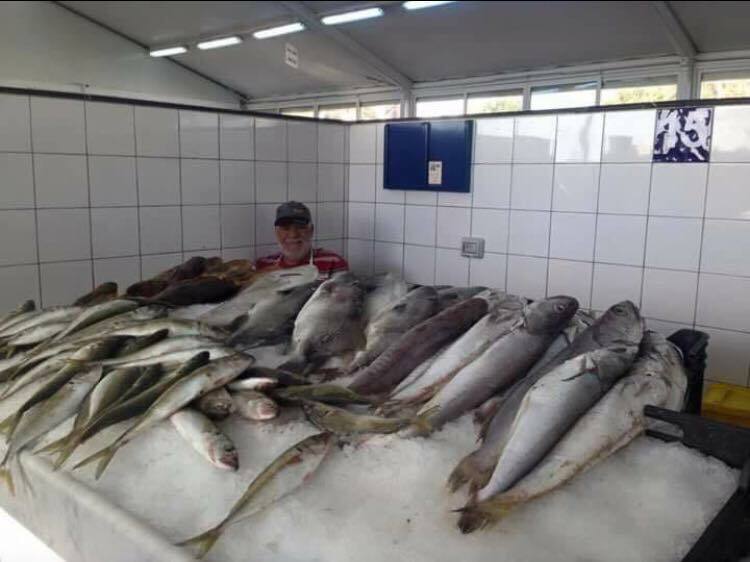 Yesterday, it reported that fish prices in Tripoli’s central fish market have continued to fall drastically from recent unprecedented highs thanks to its military naval operation ‘‘Mediterranean Storm’’. Mediterranean Storm was launched in April this year and was a military operation at sea targeting subsidized fuel smugglers and foreign fishermen in Libyan waters. It also targets Libyan fishing vessels smuggling their catch to foreign vessels for a higher hard currency return. Mediterranean Storm now forces Libyan fishing vessels to land their catch in Libya – as Libyan fish exports are currently banned. Prices have shot up drastically in Libya post the 2011 revolution, especially for imported goods, reflecting the shortage in hard currency at official exchange rates (LD 1.4 to the dollar) and the black market exchange rate of around LD 8/dollar. However, part of this inflation is pure profiteering by traders taking advantage of weak state monitoring and enforcement institutions. The Fuel Crisis Committee is an odd entity. Its roots are a committee formed in conjunction with the Tripoli Central Council formed in 2011 purely to solve fuel shortages in the capital. It coordinated fuel and cooking gas deliveries, ensuring retailers retailed their allocations of subsidised fuel and gas from Brega at the official retail price rather than profiteering by selling them in bulk or at inflated black market rates. It also ensured trucks delivering fuel to outlying petrol stations were not diverted to border smugglers or to phantom petrol stations that exist purely on paper as a cover for fuel smuggling. The committee also coordinated security and forced petrol stations to open during working hours and installed cctv cameras for security and monitoring ad provided power generators. It also introduced prepaid payment cards at petrol stations in an effort to ease the cash crisis. With the power and administrative void in the capital, together with the rest of Libya, the committee found itself playing a larger and larger role. The committee, as it has openly admitted, has no legal standing or budget beyond its narrow remit. However, finding a need and gap to fill, and urged on by popular demand, it has given itself the mandate to expand its role and actions unhindered in Libya’s post 2011 state of weak institutions. Emboldened by its success in fighting fuel and gas smuggling by land and sea and buoyed by huge popular support, the committee launched two further operations. On 21 May, six days before the start of the holy fasting month of Ramadan it launched operation Fazaat Wattan (loosely translated to mean proactive patriotic giving or national awakening). The operation, in cooperation with council police, was to counter the hoarding of goods, profiteering and the sale of out of date goods by traders. It also forced traders that had imported their goods through letters of credit at the official exchange rate (around six times cheaper than the black market rate) into selling their goods at a relatively fair price – rather than six times their cost. On 1 June the committee went further by launching operation Tafah Al Kayel (loosely translated to, enough is enough) in conjunction with the Administrative Control Authority (ACA), a state oversight authority tasked with monitoring corruption and mismanagement by state employees. The Fuel Crisis Committee said that this operation will be a wide operation aimed at all ministries and state institutions and banks. It aims to rectify the current low foreign exchange rate of the Libyan dinar against hard currencies and solve the acute cash shortage crisis. The committee said that it will also call officials, including ministers, for questioning. It warned them against failing to turn up or failing to provide documentation or obstructing investigations by the ACA. As mentioned earlier, and unsurprisingly, with some fall in prices and reduction in fuel shortages, the committee has met with huge popular support. For example, on 1 June it claimed that it had reduced fuel and gas smuggling by around 90 percent, which equates to preventing the smuggling of around 20 million litres of fuel per day by land and sea. The committee became so popular that Faiez Serraj, head of the internationally-recognized Presidency Council and Government of National Accord, met with the committee’s head this April to offer him his full support. It will be interesting to see how far the committee can progress and expand into other sectors and if it will meet with any resistance. The success of the Fuel Crisis Committee raises the question of whether the committee can act as a model for further effectiveness by Libya’s various state entities which are struggling to achieve traction in alleviating many of Libya’s bottlenecks and problems.